Dr. Eilat Mazar describes moment of awe when she saw the huge golden menorah medallion. Archaeologist Dr. Eilat Mazar, who unearthed what is widely considered one of Israel's greatest historical finds, has been speaking to Arutz Sheva about the emotional moment of the discovery. In summer excavations at the foot of the Temple Mount, Mazar unearthed two bundles of treasure containing thirty-six gold coins, gold and silver jewelry as well as a gold medallion with the menorah (Temple candelabrum) symbol etched into it. Also etched into the 10-cm. medallion are a shofar (ram’s horn) and the image of a Torah scroll. Hanging from a gold chain, the menorah medallion is most likely an ornament for a Torah scroll. In that case it is the earliest Torah scroll ornament found in archaeological excavations to date. 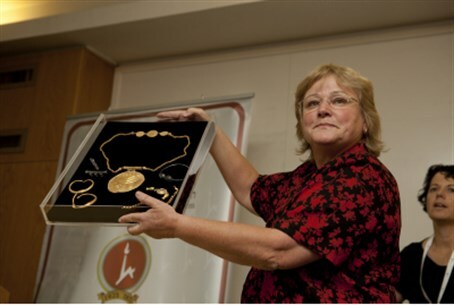 "We don’t know of finds of medallions like these. Even in the museum in London, where they do have gold medallions of this kind, they are much smaller. "When we first found the cache, the initial thought was that we needed to treat it with great care, but the moment when my eyes fell upon the medallion with the seven branched menorah (candelabra), I was completely paralyzed." Mazar explained the medallion found several months ago was kept a secret until a few days ago. "We made the discovery relatively early on during the dig that lasted many months. Once we realized what we had before us, we kept it tightly under wraps to enable us to clarify what it was we had found and avoid jumping to share the news before we were sure." She added "We also wanted to finish off the dig. It's not easy to operate a dig in Jerusalem and we didn’t want it to be jeopardized." Dr. Mazar estimated the discovery would eventually makes its way to the Israel Musuem. "In thirty years that I have been digging I have never found anything like this. It wouldn't surprise me if the Israel Museum would want to house the medallion." Since the discovery, Mazar, a third generation archaeologist, has received phone calls from all over the world, but she was especially moved by a call from Prime Minister Binyamin Netanyahu. "When I returned from one interview I received a call from the prime minister, he was interested in the discovery and we spoke for around ten minutes, about how it was found, its context, and several other questions and details. It’s a testament to the Prime Minster that he's shows interest in our discoveries." Given the date of the items and the manner in which they were found, Mazar estimates they were abandoned in the context of the Persian conquest of Jerusalem in 614 CE. After the Persians conquered Jerusalem, many Jews returned to the city and formed the majority of its population, hoping for political and religious freedom. “It would appear that the most likely explanation is that the cache was earmarked as a contribution toward the building of a new synagogue, at a location that is near the Temple Mount,” said Dr. Mazar. “What is certain is that their mission, whatever it was, was unsuccessful. The treasure was abandoned, and its owners could never return to collect it."